Deloris Van Cartier es una mediocre cantante de cabaret. Su amante Vince ha cometido un crimen, y ella decide acogerse al programa policial de protección de testigos. 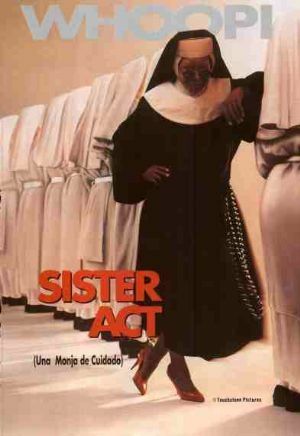 Whoopi Goldberg, Maggie Smith, Kathy Najimy, Wendy Makkena, Mary Wickes, Harvey Keitel, Bill Nunn, Robert Miranda, Richard Portnow, Ellen Albertini Dow, Carmen Zapata, Pat Crawford Brown, Prudence Wright Holmes, Georgia Creighton, Susan Johnson, Ruth Kobart, Susan Browning, Darlene Koldenhoven, Sheri Izzard, Edith Diaz, Beth Fowler, Rose Parenti, Joseph Maher, Jim Beaver, Jenifer Lewis, Charlotte Crossley, A.J. Johnson, Desreta Jackson, Zatella Beatty, Skye Bassett, Lois De Banzie, Isis Carmen Jones, Max Grodenchik, Joseph G. Medalis, Michael Durrell, Al Finney, Robert Jimenez, Toni Kalem, Kevin Bourland, David Boyce, Timothy J. Pedegana, Terry Wills, David M. Parker, Nick Katt, Mike Jolly, Jeremy Roberts, Eugene Greytak. Emile Ardolino (Dirección), Adam Greenberg (Montaje), Joseph Howard (Guión), Marc Shaiman (Música).